It includes many methods that you’re probably familiar with, from vitamins to reiki, and it can overlap with some animist practices, notably energy medicine, herbalism and folk magic. Alternative medicine is a big umbrella containing everything from relatively scientific osteopathy for backache to fermented cabbage for homosexuality (no really*). Saying that a practice is ‘alternative medicine’ tells us very little about it’s origins, function, effectiveness or intent. But a common misconception is that animism itself is an ‘alternative medicine’ like reiki or herbalism. While animist practice can include methods that have healing effects, like herbalism or energy medicine, a person’s animist practice doesn’t have to include any of these. And it’s possible for an animist to use these methods without any intent of healing or treating disease. Animism is a highly practical path which focuses on effective solutions over ideology. Animist methods rarely conflict with traditional medical treatments in the way that alternative medicine can. Because practical and effective solutions are the goal in animism, refusing treatment in favor of unproven methods is very unlikely. This means that if a medical treatment is the best solution to a problem, that’s the solution we use. Conversely, if it means that combining animist practices with traditional medicine is the best solution, that’s what we’ll do. Often, in Western animism, this means that animist practices are used to support the patient or prevent illness in the first place. For example, animist methods can reduce stress, which has been proven to cause ill health. They can also be used to change destructive behaviour, such as smoking, or to support a patient in following their medical treatment more reliably. Rather than an alternative medicine, animism is a personal and communal spiritual stance. It offers no guarantees and endorses no experts, rather demanding that we accept the uncertainty of life as it is. Energy healing is a practice that many animist practitioners use in various forms, from modern reiki and acupunture, to the ancient energy medicine of the Andes and other indigenous peoples. This practice works by removing unhelpful energies from a person’s energy system, changing the patterns in that energy system or introducing new, more helpful energy into the system. We’re having a hard time letting go of an old trauma. We’re stuck in an old pattern. We want to heal a relationship but don’t consciously know what the problem is. We feel depleted and run down. We’re overwhelmed by our feelings and thoughts. We need to honour ourselves and feel self love. We want to address a physical illness or problem on all levels. We’re in a situation we can’t change, and need support accepting it so we can make the best decisions moving forward. Energy healing can use various techniques, such as laying on of hands, visualisation, extraction methods, flower remedies, physical release methods, voice work, prayer or stone work. The techniques are used within a ceremonial container, which reinforces the divide between mundane life and the sacred work of healing. The essential elements of energy healing are the intent to provide healing and relief, and an openness to how that healing happens. We’re looking to create a space for the person to change, let go or see something new in themselves; energy healing allows us to provide that space non-verbally, to bypass rational resistance and sabotage. Extraction is a practice for removing harmful energy, emotion and thoughts. It’s found in many animist traditions around the world. Extraction is a form of energy medicine, where problems are addressed at the energetic level of a person’s being rather than the physical or mental. It works through using various tools or pure intent, to draw the harmful energy from the subject’s energy field or body. We are having trouble letting go of an unhelpful pattern of thought or behaviour. We are have left a difficult relationship and want to end it’s influence on us. We can’t shake an old trauma or wound. Extraction can use smoke, stones, breath, touch, the earth, water and many other channels for removing the unwanted energy. The removed energy is then released, often into an element such as fire, so that it returns where it’s needed. Extraction can be used as part of an energetic healing or on it’s own, and it while it’s a very specific tool it’s also very powerful at the right moment. Initiation is an ancient practice that marks a transition point in a practitioner’s life with ceremony and symbolism. Initiations can also be called rites of passage; many ancient forms still survive throughout the world. Some of these initiations are well known in Western culture, such as wedding rites, baby showers and funerals. Others, such as those when we enter a new animist practice or begin a new relationship with a spirit helper, are much more personal. We make the leap from childhood to adulthood. We enter a new relationship. We leave an old relationship. We embark on a new spiritual path. We begin the dying process. Every time we move from one life stage to the next, initiation can help us to honour and let go of the old and become open to the new. Initiations usually include a form of ceremony; this can be formal or informal, public or private, planned or spontaneous. 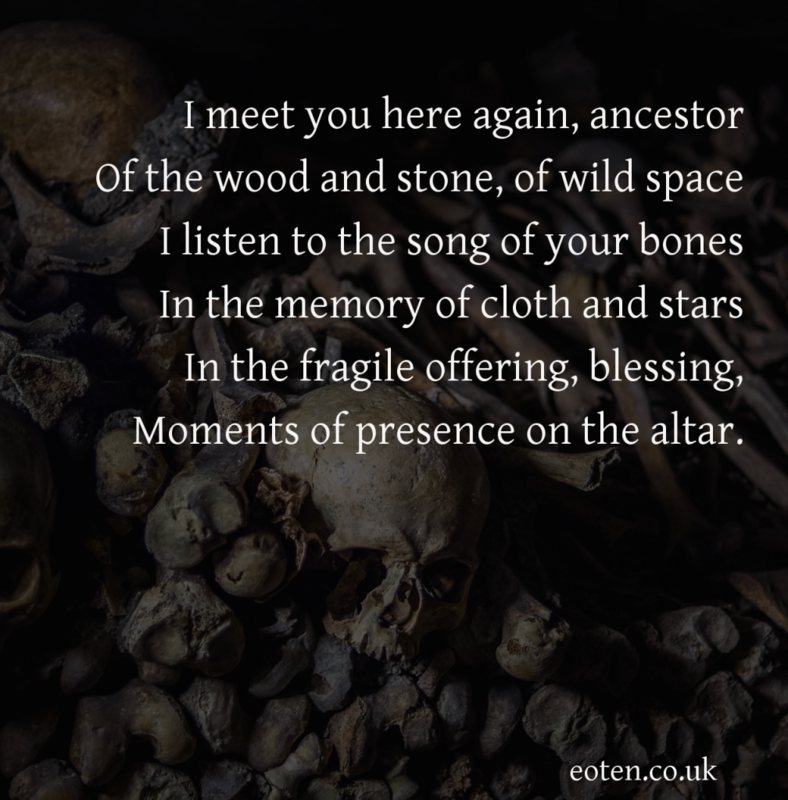 We often create on-the-spot ceremonies for these moments of transition, as part of our inherent animist natures, for example when we create shrines of flowers in the places where people die. Initiations are both about the persona who is transitioning in their life, and about the witnesses of that transition, if there are any. In an animist tradition, when we begin a new phase of practice we often experience an initiation with only our spirit helpers as witnesses, but in public rites of passage the whole community may be the witness. To begin working with initiations for yourself, consider how you might honour your new animist practice. Explore methods to create a ceremony for this new relationship, or allow yourself to be guided in creating a spontaneous initiation ritual.